The trade treaty, now up for renegotiation, has displaced millions of Mexican workers, and many thousands of U.S. workers as well. A U.S. autoworker earns $21.50 an hour, and a Mexican autoworker $3, but a gallon of milk costs more in Mexico than it does here. People were migrating from Mexico to the U.S. long before NAFTA, but the treaty put migration on steroids. As the talks to renegotiate NAFTA unfold in Washington, most attention in the United States has understandably focused on its domestic impact. Yet the treaty also had an enormous effect on Mexico, spurring a wave of forced migration of millions of people. Today a growing number of union members in all three NAFTA countries believe the treaty should be renegotiated—first, just to heal the damage done to workers. But a new treaty, or a new relationship between Mexico, the U.S., and Canada, they say, should also ensure that a new NAFTA and other treaties like it never cause the same devastation. Like the other trade agreements of our age, NAFTA is not really about trade. U.S. tariffs on Mexican imports were relatively low before it went into effect. In actuality, the treaty is an agreement to allow market penetration and investment, the relocation of production and the creation of supply chains in manufacturing. Up until the mid-1980s, Mexico had a very protective policy that restricted foreign investment and controlled the exchange rate to encourage domestic growth. A sharp shift in the late 1980s included market opening measures, privatization, and economic reforms. These reforms were accelerated by NAFTA’s provisions on foreign investment. The maquiladora industry had begun the movement of U.S. jobs to low-wage Mexican factories as far back as 1964. Today the original maquiladora program no longer exists, but the exceptions it established to Mexican and U.S. labor law and customs rules now apply through all of Mexico, and have spread into the U.S. as well. NAFTA produced an increase in U.S. investment in auto plants, electronics and garment factories, meatpacking plants, and other enterprises. Foreign direct investment rose from $17 billion in 1994 to $104 billion in 2012. U.S. companies—not only in manufacturing—expanded into Mexico generally, using economic reforms and privatization as their wedge. Walmart became Mexico's largest private-sector employer. Union Pacific and Grupo Mexico bought up the nation’s railroads and ended passenger service (which Union Pacific had long since ended in the U.S.). Big Mexican capital also moved into the U.S., where Mexican investment last year reached $16 billion—the level of U.S. investment in Mexico in 1994, when NAFTA went into effect. A number of these corporations brought with them the anti-worker policies they had honed at home. Grupo Mexico, which began as the Mexican subsidiary of American Smelting and Refining Company (ASARCO), grew larger than the parent. Directed by the Larrea family, it bought out the U.S. stockholders, making it the owner of mines in Arizona and the Southwest, where it is now trying to enforce the same union-destroying cuts on U.S. miners that it imposed in in its Mexican mines, Cananea and Nacozari. El Super, a division of the Mexican Chedraui retail corporation, has become a large supermarket chain in southern California, fighting with the UFCW (the leading union of supermarket workers) and trying to operate as many stores without unions as it can. According to the Southern Poverty Law Center, migrant workers who enter the U.S. through the H2-A visa program endure conditions "close to slavery." 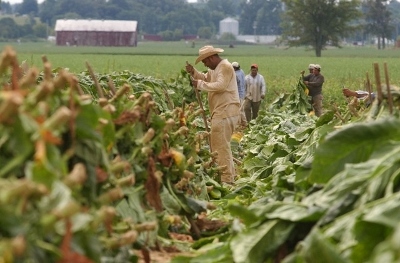 Here, H2-A visa holder Balentin Gutierres, center, prepares to spike dark tobacco at Rose Mount Farm, south of Owensboro, Kentucky. A U.S. autoworker earns $21.50 an hour, and a Mexican autoworker $3, but a gallon of milk costs more in Mexico than it does here. It takes a Mexican autoworker over an hour's work to buy a pound of hamburger, while a worker in Detroit can buy it after 10 minutes. That doesn’t mean that the Mexican workers are less productive: Mexican workers in the General Motors plant making the Sonic, Silverado, and Sierra produce the same number of cars per hour that the workers do in the U.S. plant making the same models. The difference means profit for GM, poverty for Mexican workers, and the migration from Mexico to the U.S. of those who can't survive. Although General Motors autoworkers make the same number of cars on both sides of the border, it takes a Mexican autoworker over an hour's work to buy a pound of hamburger, while a worker in Detroit can buy it after 10 minutes. 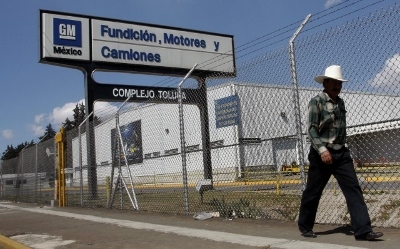 Here, a man walks past the entrance to a General Motors plant in Toluca, Mexico. The treaty forced yellow corn grown by Mexican farmers without subsidies to compete in Mexico’s own market with corn from huge U.S. producers, subsidized by the U.S. farm bill. Corn imports rose from two million tons to more than ten million tons from 1992 to 2008. NAFTA prohibited price supports, without which hundreds of thousands of small farmers found it impossible to sell their corn or other farm products for what it cost to produce them. Mexico imported 30,000 tons of pork in 1995, and by 2010 that had grown to 811,000 tons, costing 120,000 jobs. The World Bank in 2005 found that the extreme rural poverty rate of 35 percent in 1992-94, prior to NAFTA taking effect, jumped to 55 percent in 1996-98, after NAFTA was in place. By 2010, 53 million Mexicans were living in poverty, about 20 percent in extreme poverty, almost all in rural areas. 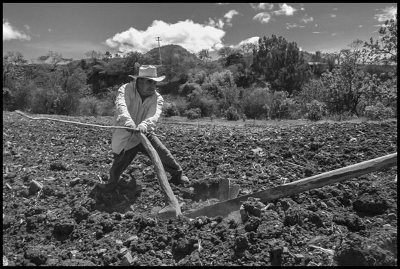 Zacarias Salazar plows his cornfield in Juxtlahuaca, Oaxaca, behind oxen, in the traditional way with a wooden plow. Because of corn dumping enabled by the North American Free Trade Agreement, it is almost impossible for Salazar to grow and sell corn in Mexico any longer, and his crop is now mostly for the sustenance of his family. In the agreement's first year, 1994, one million Mexicans lost their jobs, by the government’s own count. According to Jeff Faux, founding director of the Economic Policy Institute, “the peso crash of December, 1994, was directly connected to NAFTA.” And as the border maquiladora factories were tied to the U.S. market, Mexican workers lost jobs when the U.S. market shrank during recessions. In 2000-2001, at the time of the dot-com crash, 400,000 jobs were lost on the U.S./Mexico border, and in the Great Recession of 2008 thousands more were eliminated. With the border so close, many crossed it to survive. NAFTA's purpose went beyond freeing investment. The treaty also produced displaced people, who then became the workforce in the maquiladoras and the fields of Baja California, and swelled an immense wave of migration to the U.S. and Canada. This was more than a foreseeable consequence of NAFTA—it was literally foreseen, and was as much a part of its purpose as the relocation of production. In fact, Congress had been warned that NAFTA might increase poverty and fuel migration. When it passed the Immigration Reform and Control Act (IRCA) in 1986, Congress set up a Commission for the Study of International Migration and Cooperative Economic Development to study immigration's causes. Its report, delivered in 1990—three years before Congress ratified NAFTA—recommended negotiating a free trade agreement between the U.S, Mexico, and Canada. But it also warned, “It takes many years—even generations—for sustained growth to achieve the desired effect," and in the meantime would create years of “transitional costs in human suffering.” Nevertheless, the negotiations that led to NAFTA started within months of the report’s delivery. People were migrating from Mexico to the U.S. long before NAFTA, but the treaty put migration on steroids. In 1990, 4.5 million Mexican migrants were living in the U.S. By 2008 the number reached 12.67 million—roughly 9 percent of Mexico’s total population. Approximately 5.7 million of these immigrants were able to get some kind of visa, but another seven million couldn’t, and came nevertheless. The 1986 immigration reform act, which led to the negotiation of the free trade agreement, also re-established the bracero program, which had been abolished by the civil rights movement in 1965. Beginning in 1986, various categories of “guest worker” visas have been created, like the H2-A visa for agricultural workers. The Southern Poverty Law Center called these programs “close to slavery.” In the last five years the number of H2-A workers recruited to come to the U.S. has risen from about 60,000 to 165,000 last year, and is predicted to reach 200,000 workers this year. That's 10 percent of the whole farm labor workforce, and in states like Washington, it's over a third. The laws that created this migratory workforce operate as a huge subsidy to U.S. agribusiness. U.S. employers don't have to pay the social cost of producing their workforce—the schools, health care, housing, or basic services in the Mexican towns from which the workers come. Instead, the burden falls on workers in the U.S. Mexican communities have become dependent on remittances by Mexican workers in the U.S., which totaled $27 billion in 2016. In 1996 they came to just $4 billion. During the debate on NAFTA’s original enactment, executives of companies belonging to USA•NAFTA, the agreement's corporate lobbyist, made extravagant claims that U.S. exports to Mexico would create 100,000 new jobs in the U.S. in its first year alone. Michael Wilson, director of the Heritage Foundation, predicted, “it will create an estimated 200,000 new jobs for Americans, reduce illegal immigration from Mexico, help tackle drug trafficking, strengthen Mexican democracy, and human rights, and serve as a model for the rest of the world.” President Clinton claimed: “I believe that NAFTA will create 200,000 American jobs in the first two years.” When he said “I believe that NAFTA will create a million jobs in the first five years,” the claim was so extravagant that his press secretary had to walk it back the following day. Clinton also promised that NAFTA would curtail the border crossings from Mexico. Speaking at the White House in September 1993, as the treaty was up for ratification in Congress, Clinton declared, “there will be less illegal immigration because more Mexicans will be able to support their children by staying home. This is a very important thing.” At a time when the recession of the early ‘90s had devastated the Southern California economy in particular, Clinton’s promises of reduced immigration played off voters’ fears. Mexican President Carlos Salinas de Gortari and his aides toured the U.S. for a year, also vowing that NAFTA would take pressure off U.S. workers. Full-page ads appeared in newspapers in which Citibank joined the chorus. In the end, the treaty was supported by almost all Republicans, joined by a minority of Democrats—just enough to ratify it. Detroit lost half its population as the auto industry left, and today every engine in a Ford comes from Mexico. Huge swaths of other industrial cities have also taken on that abandoned look that comes with boarded-up homes and storefronts. But the working families who lost those outsourced jobs didn't disappear. Instead, hundreds of thousands of people began an internal migration within the U.S. larger than the dustbowl displacement of the 1930s. Former machinists and factory workers went on the road, landing low-wage jobs in fast food restaurants or Walmarts. Many lost their families. Some began living on the streets. Job losses had a particular impact on workers of color. Plants that freeze broccoli and strawberries for frozen food companies like Green Giant moved from Watsonville to Irapuato. That cost the jobs of thousands of women who’d come north from Mexico, and then spent years on the freezer lines in Watsonville. In auto and other manufacturing plants, African American workers had long since broken the color line into more skilled and better paying jobs, only to see them relocated and the plants close. When NAFTA had come before Congress, its supporters argued that any race to the bottom by corporations determined to lower labor costs or violate workers' rights could be blocked by the so-called labor protections in a side-agreement to NAFTA—the North American Agreement on Labor Cooperation. This made NAFTA more politically palatable for those Democrats in Congress who wanted to ratify the treaty anyway. The record of the side agreement is dismal. In its most recent status report, the Department of Labor lists the 37 cases—24 against Mexico, 13 against the U.S., and two against Canada—that have been brought under the agreement in the quarter century since NAFTA’s passage. Almost all against Mexico concerned violations of the right to freedom of association, to strike and to bargain. Cases against the U.S. involved violations of union rights and the rights of immigrant workers. The two cases against Canada concerned violations of the right to collective bargaining. The most any union or group of workers ever got from filing a case was “consultations” between the governments, and public hearings. There is no provision in the agreement for assessing penalties for violation of union rights. There are minor penalties for violating child labor or occupational health laws, but they've never been invoked. Not a single union contract was signed as a result of the side-agreement process, nor was a single worker rehired. Those unions that have filed cases have generally sought to use the process to gain public exposure of abuses, and exert indirect pressure on employers. Was this just a flaw in the enforcement mechanism or something deeper? The purpose of NAFTA and other trade agreements has been to open economies for corporate investment, using lower labor costs as incentives to attract investment. It is unrealistic to expect that a side agreement to enforce already weak labor laws could mitigate the treaty’s fundamental purpose. Despite its corporate tilt, however, NAFTA did produce a new relationship among unions and workers in all three countries. Many working people in the United States, especially if they belonged to unions that campaigned against NAFTA, started to open their eyes about the real conditions of their fellow workers in Mexico, and could see how those conditions encouraged employers to relocate their jobs. In response, workers and a number of progressive unions on both sides of the border have come closer together. When the Mexican government, for instance, tried to change Mexico's labor law, or passed corporate-backed education reform, or began to privatize the electrical and oil industries, U.S. unions have joined with Mexican unions to fight these changes. Many U.S. unions today understand that the impact will be felt in the displacement of Mexican workers and their migration to the United States and Canada, in the pressure their own workers will feel to accept concessions, or in the closure of plants and workplaces. Even before the treaty passed, activists in all three countries set up networks like the Border Committee of Women Workers, the Coalition for Justice in the Maquiladoras, Enlace and the Workers' Support Center. The United Steelworkers became the crucial support base for Mexican miners in their eight-year strike in Cananea, one of the world's largest copper mines, and gave sanctuary to the union's leader, Napoleon Gomez Urrutia, when he was forced to leave Mexico. 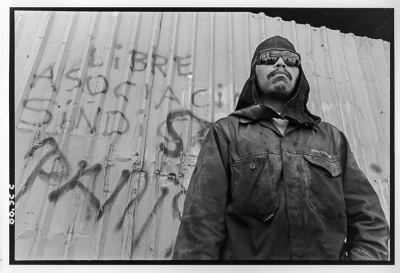 The United Electrical Workers and Mexico's Authentic Workers Front developed a permanent strategic alliance, assisting in each other's organizing drives. This kind of cross-border cooperation and solidarity is now a fact of life in the labor movements of all three countries—a consequence the authors of NAFTA certainly did not intend. The debates around the treaty, which came at the same time as the breakup of the Soviet Union, also helped spell the death knell of the U.S. labor movement’s Cold War support for free-trade policies and its opposition to other nations’ more radical unions. Over the past two decades, the labor movement has been moving towards new principles of solidarity with other nations’ unions. NAFTA had an equally great impact in changing U.S. labor's way of looking at immigration and immigrant workers. In 1986 the AFL-CIO supported IRCA, the immigration reform legislation that made it illegal for undocumented workers to hold a job. But the wave of immigration that NAFTA produced changed the demographics of many U.S. workplaces, and with it, the demographics of U.S. unions. Not only did the number of immigrant workers increase, but over the years they took on a growing role in organizing unions in many industries, and eventually, in the leadership of those unions themselves. At the same time, U.S. unions saw immigration law and policy used against them. In Washington state 1000 apple pickers were fired when they tried to join the Teamsters, and in Nebraska 3000 meatpacking workers, many of whom either belonged to unions or were trying to organize unions in their plants, were driven from their jobs. In some cases their employers called in the federal immigration agents, but in others the Federal government itself demanded massive firings. In consequence, in 1999, the AFL-CIO changed its official position on immigration policy, calling for an end to the deportation and firing of undocumented workers, for legalizing people without papers, and for a trade policy that doesn't produce poverty and displacement. Today the AFL-CIO's statement on NAFTA renegotiation declares that, “all workers, regardless of sector, have the right to receive wages sufficient for them to afford … a decent standard of living.” The federation would prohibit the export of products made by companies paying less. Progressive Mexican unions and community organizations support this, because it would give workers and farmers a future without having to leave their homes in search of a living wage. On the other hand, the Mexican government now argues that Mexican wages must stay low to attract investment, and has accused independent unions there of betraying the national interest by seeking to raise them. With its presidential election coming next year, that position may well doom its ruling political party, not just to unpopularity, but to massive rejection at the polls. Andres Manuel Lopez Obrador, a past leftwing candidate now leading in the polls, has condemned the policy of using low wages to attract investment, and called for an economy based on producing jobs and social services that would give Mexicans a future in Mexico. The basis of labor solidarity is in many ways stronger today than it was in 1994, but labor is still playing a catch-up game. Border workers have gone on strike in four Juarez maquiladoras and the fields of San Quintin in recent years, and in Cananea and the Rio Sonora valley miners are still on strike after nearly a decade. In the U.S., where millions of workers are very aware, and fearful, about the loss of their jobs because of NAFTA and globalization, unions have yet to convince many people that solidarity, not hatred of Mexicans or of immigrants, is the real answer to their desperation. But when unions began to respond to NAFTA in 1993 and 1994, they knew they were in for a fight, yet they believed that change was possible nonetheless. It still is. Facing one of the most labor-hostile U.S. governments in decades, and trade proposals likely to undermine their strength even further, unions can still be a standard bearer for workers in all three countries. order the book on the UC Press website.